Reality TV is everywhere—it’s even on CNBC! Yes, that’s right, the financial-focused network has its own popular reality show, The Profit, where millionaire entrepreneur Marcus Lemonis takes business risks by putting his own money into small businesses that are failing, and attempts to turn them around. In a rather touching episode, Lemonis takes over the Key West Key Lime Pie company, where the manager, Tami Forbes, is a strugging mom of 8-year-old twins and is pregnant with her third child. 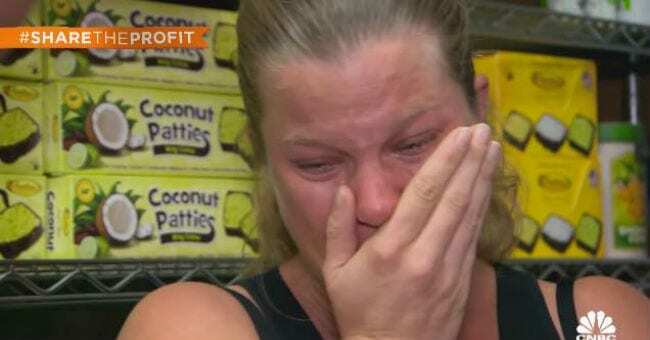 The episode outlines how Tami does pretty much everything at the store, from marketing to stocking the shelves, but she only makes $300 a week, and has to bartend part time to provide for her kids in addition to her full-time job. For many working moms, taking maternity leave is a necessity AND a sacrifice, since many companies in the U.S. do not offer any paid maternity leave. So while the birth of a child is always a joyous occasion, it can be very stressful financially, especially to families like Tami’s. So glad Lemonis picked this shop—and this mom—to invest in! I love this story and I hope it inspires business owners everywhere to pour into employees and offer benefits to expectant moms!